In the late 1800s, the Old Course was getting too popular, largely due to the extra visitors flocking to St Andrews on the trains. The R&A decided to pay for the New course to be built in return for allocated tee times on the Old. These rights are still enclosed in an Act of Parliament passed in 1894, the precursor to the current Act of 1974, which specifies how the public St Andrews links courses are managed. 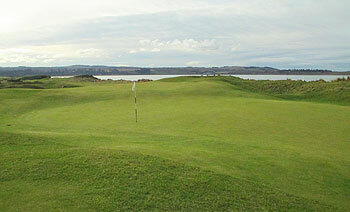 The New course was designed by Old Tom Morris and B Hall Blyth and opened for play in 1895. This makes it one of the oldest “new” courses in the world! Situated adjacent to the Old course, the New is often referred to as the local’s favourite because it is tighter and more defined than the Old. It possesses some similarities to the Old, shared fairways, a double green at the 3rd and 15th and the traditional out and back layout. In many ways it plays and feels more "normal" than the Old – it’s certainly less quirky and perhaps prettier too, with swathes of dense gorse providing brilliance of seasonal colour. The fairways are undulating, but they don’t have the same slopes and curves as the Old. Consequently, there are fewer hanging lies. There are some great holes on the New, especially in the dunes around the turn for home. The 10th hole is a tough 464-yard par 4 and it's a cracking hole which Bernard Darwin also liked, but thought that it was not in the Old course mould. In his 1910 book, The Golf Courses of the British Isles, he wrote: “This is nevertheless a really fine one, running down a narrow gorge between two ranges of hills, with a fine, slashing second shot with the brassey, albeit more or less a blind one”. We think that if the New Course could be transported to virtually any other coastal stretch of the British Isles, away from the shadow of its auld mater, it would surely have a higher reputation and be recognised as the excellent links course it is. Who knows? If the course had not been in the shadows for so long and perhaps updated to a similar extent as many other links courses, it might well have played host to an Open Championship. In 1910, Darwin wrote: “Still there occasionally comes a time when we grow sick to death of the crowding and waiting on the Old course, and then we are glad enough to steal away on to the New course and have a round, which will probably be at anyrate a comparatively quick one.” Could this really be the answer as to why the locals prefer the New course? Played here in February 2019. The weather was unseasonably warm and much to my surprise, they had just lifted the fairway protection. The course was in great shape for that time of year and the greens rolled as true as any I've played on. This really is a classic links experience with old Tom's out and back layout providing a fair test. I was fortunate enough to play it on 2 calm days, with the 1st time there genuinely being not a breath of wind. However you can see the course sets up for tougher conditions with wide fairways and decent sized greens. There are only a few holes where you are elevated and can really see all that's in front of you. For that reason I enjoyed my 2nd round here much more than my 1st. On the 2nd time round I really got a feel for the course and the cleverness of the holes. Standout holes for me are the par 5 8th with an incredible opening between 2 dunes into the green. Also the par 3 9th. Maybe a little on the long side, but when you see the large punchbowl green you realise how big a target it is. Finally the par 4 15th, which shares a double green with the 3rd. It's only after a couple of goes you realise how important it is to play to the left off the tee to really open up the front of the green. A very clever layout that has stood the test of time and I would encourage all visitors to the area to try and get round it a couple of times. The first time I played the New Course was during a week in St Andrews, exploring the town and all the courses of the Links Trust. I thought it was a wonderful, classic, links course. The second time was during a 72-hole charity day of golf on four courses around the Fife region: Drumoig, Scotscraig, New course, and finally Fairmont St Andrews (Kittocks). So my second time playing this course was after 36 holes of golf that day and it had been raining for the majority of them. When we arrived at St Andrews it was raining sideways. On any other day I would have stayed inside, but this was a charity event and people had given us donations to play 72 holes, so golf it was. It's quite difficult to play with an umbrella wedged into your midriff to stop it blowing away and I only really remember a few other things about the New course from the day: my 2-hybrid saw a lot of use with half power swings just to advance the ball 100m down the fairway; and, I'd never resented playing golf before, but I remember that distinct feeling at one point. But, we finished the round, collected some more donations into our charity bucket from people who thought we were crazy (they'd be correct!) and set off for the final round. I also recall feeling a real sense of sadness for those playing the Old course that day. For some it may have been the culmination of a lifetimes dream and the weather was just horrible, to the point of making golf almost impossible. While the Old course was its usual heaving self (even at 7 in the morning) we teed off at 7am and played millionaires golf. There was no one in front and the next group teed off at 8. Enjoyed a wonderful golf course in 2 hours, 40 minutes. This is a decent, fun golf course that has some seriously goood holes - 6, 8, 10 (best hole on the course), 15 and 16. It also features a 225 yard par 3 which also has a tough green complex. Course was in great condition with fairways tight and greens firm and smoooth. Definitely worthy of inclusion in the top 100 in UK. Pricey but that is the cost of playing any of the courses at "the home of golf" which seems to generally target the wealthier clientele that make the pilgrimage from overseas. Good review of a good course, but ref the cost, I appreciate value is all about perception but anywhere else the New would be higher ranked and more than £80 high season. Sandwiched between the Old and Jubilee courses the New is at the mercy of the wind and essentially plays out towards the Eden Estuary and then back towards town. Many locals say they prefer the New to the Old and you could argue it is the truer, fairer test of golf but as a result of that it loses some quirk, charisma and sparkle. That said this is a very fine golf course with a number of excellent holes. There is a lovely flow to the course, early on especially, where the next teeing ground is just a few paces from the previous green. There is a lot of subtlety about the course and some of the green complexes are outstanding – the ones at the third, fourth, fifth and sixth early on in the round are brilliant; clever, subtle and with no wind the only real defence of the course, save for the mild littering of fairway pot bunkers. The New course is an essential play if visiting St. Andrews for any period of time. It may not be the most visually appealing but it is arguably the most exacting of all the layouts and a very high quality classic links experience. The New course is judged by many to be more difficult than the Old. It is sandwiched in between the Old Course and the Jubilee on the seaward side. It is tighter and has more gorse lined fairways than the Old Course. Because the course runs in a clockwise direction there tends to be more bail out areas to the right. This is in complete contrast to the Old Course where, normally, left of the tee is the safest route. If you are inclined to be a little inaccurate then the par three 5th will increase your anxiety levels. Almost all of the 180 yards is flanked by expanses of gorse on both sides of the fairway. You need to thread your way past the two greenside bunkers but don’t over-club as there is also gorse not far from the back of the green. The New course is particularly interesting around holes 8 and 9. The 8th is index 1 and heads towards the Eden estuary. On a windy day the par three 9th can be a nightmare. It is 225 yards from the back with the Eden Estuary running all the way along the left edge of the fairway. There are no bunkers on this fairway and anything slightly right will generally feed back towards the slightly sunken green. At the back of the 16th green you will see a rare sight for St Andrews – a clump of stunted trees. The 18th is a tight par four of 408 yards with the green not far from the general dining area of the visitor’s clubhouse, although you may not feel as watched as on the Old course, there is usually a number of people following your progress. An enjoyable, easily-walked course requiring a good variety of shots. The holes are well-defined with good par threes and a strong finish. Less exposed than the Jubilee. It does, however, benefit from it's location regarding ranking. This is top 100 ahead of Hunstanton and Portstewart? It is more comparable to Littlestone or Seacroft. Really good course in its own right, great to double up with when playing the old course. When we played in early April the course and in particular the greens were in top condition. The course is a good test of golf, especially from the white tees. Stand out holes for me were the long par 5 8th and the long par 3 9th. Definitely worth playing and would obviously great much more credit if not next the most famous course in the world!! Returning the other day, some eight years after I first played here, I was left with much the same impression as before; the New is a good, solid links that’s well worth playing (especially in the winter at half the normal green fee rate) but don’t expect to be bowled over by it. Unlike when I played it previously, you now have to use a mat to play from fairways during the winter months but, according to the starter, they don’t mind you kicking your ball to the side and playing from the semi rough. Some severe gorse removal to the left of the fairway and at the back of the green on the par three 5th has resulted in the construction of some weird looking jagged mounding at the back of the putting surface, which I can only hope will soften in due course, once the gorse regenerates. I agree with others who speak favourably of the 225-yard 9th hole; I’m not a fan of long par threes but this one is a real cracker, played slightly uphill and semi blind to a bowl-shaped green that should gather tee shots to the pin, assuming they’ve been struck firmly enough on the tee. On the inward half, the back to front cant of the shelf green at the 13th has, I suspect, ruined many a scorecard down the years whilst the internal contours of the elevated green at the 15th (a putting surface shared with the 3rd hole) are also more than capable of making a golfer look foolish as they attempt to hole out. The Top 100 site currently ranks the New above the Duke’s within the Kingdom of Fife but I’d personally reverse that order. The New’s good but it’s not great; enjoy nonetheless. I agree completely with your comments on the mound at the back of the 5th. I would challenge anyone to come up with a more un-natural or ugly feature but I dont think its possible. This used to be one of the best holes on the course when the green was surrounded by gorse - now it is the most ridiculous looking hole on the course. That aside, - I do rate the course more highly than you do Jim. I don't often disagree with the esteemed Mr McCann, but I guess that's the beauty of golf and this august site. As a traditionalist Duke's has some very good holes, but it could be a new-ish course anywhere. The New has a great setting, fantastic greens each time I have played on it, a few great holes, and one still has the feeling of playing back to St Andrews at the end of one's round. My amendment of relative Fife rankings would instead respectfully place Ladybank above Duke's, and Crail above Lundin and Leven.